In the wake of rumours circulating in the market that from January 1, 2014, banks will not accept banknotes with anything written on them, the Reserve Bank has urged members of public not to fall prey to such rumours and to use their banknotes without any fear. The Reserve Bank of India has clarified it has NOT issued any such instructions. It has further clarified that it had issued instructions on August 14, 2013 only to banks advising them to instruct their staff not to scribble or write on the body of the banknotes since it was observed that the bank officials themselves were in the habit of writing on banknotes which went against the Reserve Bank’s Clean Note Policy. 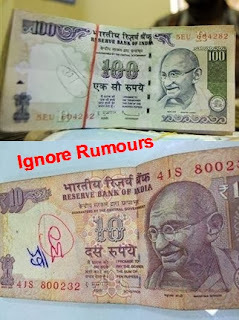 Reiterating that writing or scribbling on banknotes works against its Clean Note Policy, the Reserve Bank has also sought co-operation from all members of public, institutions and others in keeping the banknotes clean by not writing/scribbling anything on them.